The BOPX Trailer Unit is based on our highly engineered, technologically advanced BOPX hydrostatic tester which is efficiently integrated into a custom manufactured 8’ x14’ heavy duty trailer. It is one of four different configurations offered the include the Skidded, Truck, and Offshore Unit. 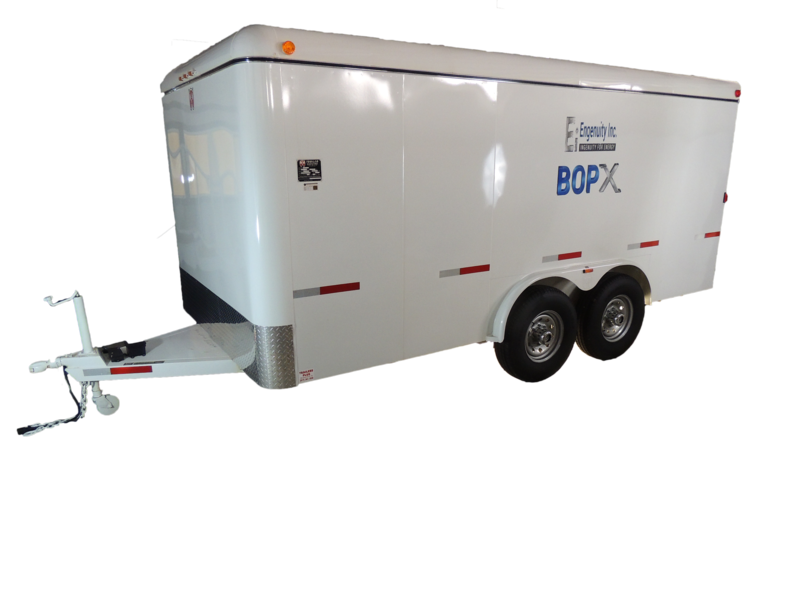 The BOPX Trailer Unit is an efficiently packaged, robust, hydrostatic test system capable of safely performing tests at pressures up to 20,000 psi. Like all of our BOPX configurations, the Trailer Unit utilizes the BOPX EZ Test interface and control software. The BOPX Trailer Unit is equipped with the EZ Test interface and control software. This software utilizes advanced automated operation and control algorithms that determine the psi/min decay rate, volumetric leak rate, apparent compressibility, and apparent orifice size. The BOPX Trailer System utilizes advanced automated operating and monitoring capabilities that mitigate the unpredictability of personnel and the manual pressurization process. This results in a safer, faster, and more cost effective test.